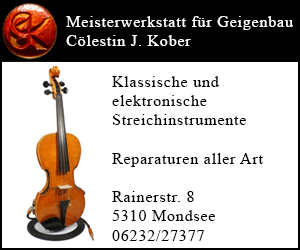 First Prize winner of the 2007 Monte Carlo Violin Masters, acclaimed as the “Adami Classical Revelation 2006”, First Prize F. Kreisler in 2005 in Vienna, Emily Anderson Prize of the Royal Philharmonic Society in 2004 in London, Special Jury Prize Y. Menuhin in 2000, Fifth Prize H. Wieniawski in 1997, First Prize L. Spohr in 1995…, Fanny has already established herself as an artist of great distinction on the international stage and is considered to be one of the best violinist of her generation. Her talent and commitment are supported by many foundations and organizations in the world, of which, lately, the Fondation Safran pour la Musique (Paris). She is also supported by Vladimir Spivakov and Anne- Sophie Mutter. She is a regular member of the «Mutter’s virtuosi». Born in 1984, Fanny started playing the violin at the age of seven. She was taught by L. Kolos, before joining J.J. Kantorow’s postgraduate course at the CNSMPD (Paris Conservatory) in 2000, when she was sixteen. In 2003, she went on to study with I. Rashkovsky at London’s Royal College of Music, where she was awarded her “Artist’s Diploma” (2004). Then, she was coached by P.Vernikov at the Konservatorium in Vienna and O. Semchuk at the Scuola di Musica di Fiesole (Italy). At the same time, Fanny attended many master-classes, particularly with Ida Haendel, Zakhar Bron, Michèle Auclair, Boris Kushnir, Donald Weilerstein, Shlomo Mintz and Jean-Claude Pennetier. Her elegance, the brightness of her playing, her interpretations involving sensitivity and authority received many times the critics’ praise. 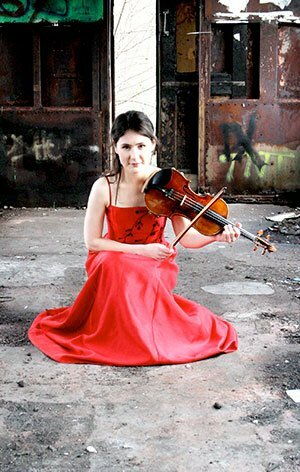 Her first CD, dedicated to the complete Violin Solo Sonatas by Eugène Ysaÿe and released in 2007 for Nascor, has been highly acclaimed by the press. The complete Saint- Saëns Violin Concertos (SinfoniaFinlandia/P. Gallois) recorded under Naxos and released in November 2010 has been awarded a « Choc » from the French musical magazine Classica (February 2011). Fanny’s next project for Naxos of Saint-Saëns complete violin and piano works, with Vanya Cohen, has just been recorded. Fanny is a regular guest on French and foreign radio and TV shows. To name only a few : « Tribunes des Jeunes Musiciens » from the Radio Suisse Romande, « In Tune » from BBC Radio 3, « Un Mardi Idéal » by Arièle Butaux , « La Cour des Grands » by Gaëlle Le Gallic, « Le Magazine » by Lionel Esparza and « Plaisirs d’amour » by Frédéric Lodéon (France Musique), « Toute la Musique qu’ils aiment » with Alain Duault (TV FR3), « La Boîte à Musique » with Jean-François Zygel (TV FR2), numerous programmes on Mezzo TV chanel, « Dame Myra Hess Memorial Concerts » (radio live WfMT, Chicago). In 2010, Fanny collaborated with famous Japanese dancer and choreographer Saburo Teshigawara in « Obsession », performing live Ysaÿe solo sonatas. After her debuts in 2011 with the Wiener Philharmoniker at the Lucerne and Enescu Festivals in duo with Antoine Tamestit and under the baton of Franz Welser-Möst, 2012 will feature Fanny’s debuts with the London Philharmonic Orchestra in Eastbourne and Brighton with conductor Fabien Gabel (Mendelssohn) and with the Orchestre National de France with Alain Altinoglu (Saint-Saëns n°3). Fanny will also perform in recitals in Tokyo, Copenhagen, New York (Chelsea Music Festival), … as well as at the Folle Journée in France and with Jean-Frédéric Neuburger in Switzerland (Orpheum Stiftung). The next season will see engagements with the Orchestre National de Montpellier led by Christoph Alstaedt (Brahms), a tour with the Tchaikovsky concerto bringing her to the Konzerthaus of Vienna and Berlin, as well as in Prague, Bratislava, Graz, Bern and an Asian «Mutter’s Virtuosi» tour. Fanny plays on a Matteo Goffriller violin made in Venice in 1700.